Does just as I was hoping it would! Great for that extra hose,keeping it out of the mud and in easy reach. Great way to keep organized and tangle free. Can go anywhere. It holds my watering hose so well and it is neat. It is so easy to install too. This hose caddy is made of metal with rubber ends. It was easy to assemble with a medium sized screwdriver. It holds a 25 ft. hose and occasionally tips slightly to the side, but that could be because it's anchored in bark dust instead of soil. 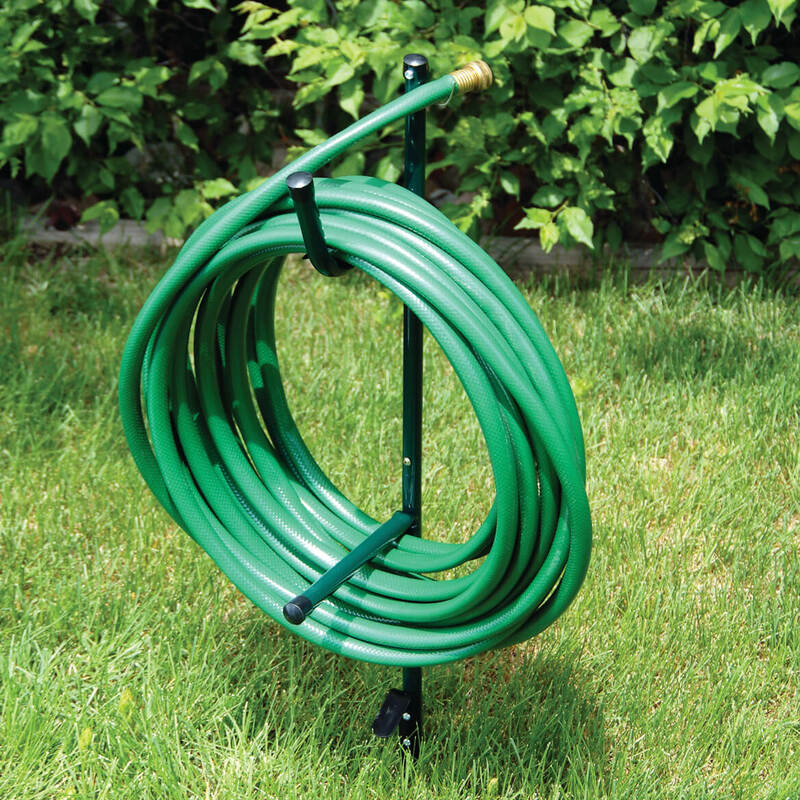 I think it's a great bargain and ordered three more for other short hoses around my yard, though I assume it can hold longer hoses as well. The hose holder is of good quality steel and is a convenience in the garden. I read all the reviews for this product before buying it. I wanted it to put my Flexhose on it. It is perfect for that. It's lightweight and easy to put together and works for my purpose. It works perfectly for a lightweight hose. I was surprised at the quality. I have several hoses connected and this caddy handled all of them. Very convenient to relocate. Very pleased. Easy to assemble, easy to locate. It was very easy to assemble. It does the job. This is good for a smaller, lighter hose. Perfect for my hose. This hose caddy works but you need packed soil for it not to fall over. Though I like it and would recommend it for light duty stagin. The apparatus was fairly easy to assemble with the exception of the hose hook...not really a good place was provided for it. When the description said "light weight", I should have realized it was going to be pretty "flimsy". I use to keep hoses more organized. No more tripping over the hoses and getting kinks. They're a little light weight, but still a good value for the money. This hanger has seven parts, a lot for a small device, and each must be screwed or bolted on. It takes time, dexterity, two wrenches, and a screwdriver. A vise would help if you're single. I had to wet the soil to stake it, but I did like that it doesn't have to attach to the building or plumbing, and it works fine. Not that easy to relocate, though. This is perfect for my 25' collapsible hose. Bends easily if you hit a rock pushing it in the ground. It assembled easily, but I'm not sure it it will be sturdy enough for heavy use. I will know more at the end of the summer. This is the kind of product I need for my patio garden, but it is not sturdy. The stake bent on the first time I pulled a little on the hose. The weight of the hose was ok, but when the water turned on, the extra weight bent the hose hanging bar. I have been able to stick it back in the ground and am still using it, but I doubt it will last the season. Post into the ground is way too short. The entire caddy tips over with the slightest tug on the hose. I tried to use next to my house but too filmsy to hold my hose. I guess if I used one of those scrunch you hoses it would be ok. It kept falling over from the weight. I was really hoping it would work. I sent back one I hadn't opened and will try to use the one I opened by putting it by the fence and securing it to it to give it more strength. could not complete assembly because of missing upper hose plate part. The hose holder is flimsy. After assembly which was pretty easy, I was unable to push it all the way into the ground without bending the foot peg. After about a week, the weight of the hose caused the whole assembly to tip over. This would be good for hanging gloves or something, but definitely not a garden hose. Easy to assemble???? No way. Very flimsy too! Misrepresented. Flimsy. A toy, not a tool. Easily assembled. Adequately packaged. Poorly designed. Too light-weight. Flimsy. Doesn't go into the ground far enough to hold hose upright _ _ especially after rain and wet soil. I bought 6 of them. I didn't want to reel up my hose after each use, so I used them by spacing them apart along my front yard to hang my hose on the top 1/2 of them so it kept the hose off the ground. I didn't use it to wrap the whole hose around it. I don't think it would hold up to wrap even a small hose around it. First issue is it doesn't say you have to assemble it by attaching 7 screws. Make sure you screw each on real tightly or it won't hold the parts in place. It didn't have any written instructions. It only had a picture with the parts next to the pole, but it didn't state how to assemble it. Not all parts looked like the picture & I'm real good at putting things together. The top plastic caps doesn't fit over it very well, because there's a metal hook that also goes inside the hole, so it's in the way for the cap to go over it securely. As I used a rubber mallet to hammer each stake in the ground, the stake either bent as it went in (And the ground was soft from raining days before) or the stake bent after laying the hose over the top of the first level. Or, when I did hang the hose on the top of it, the pole would fall over, because the stakes aren't long enough to stay stable in the ground, not even with a little weight on it. The stakes need to be a few inches longer, so it will stay in the ground & handle any weight on it. Great concept, if they made the stakes a lot longer. Also, I feel they need to be taller. I'm only 5'2" & I was bending down to hang the hose just on the top 1/2, but if you wanted to wrap the hose around it, as it was made for, you would have to get on you knees to get it around both levels. Doesn't hold a lot of hose. Hose slips off the bottom arm. Not a sturdy product. I should have spent more on a better product. this will not hold a heavy hose unless you tie it to something! Seemed like a good product. I needed it to place a hose closer to my dog kennel. It was too flimsy to hold the weight of the hose. A waste of money. The holder would not stay steady with a 50 foot hose. The metal piece that is stepped on to push stake in ground bent with first try. I was disappointed in product. Yes,easy to assemble, but once hose was put on the holder bent, bottom stake bent. Was a gift for a friend so will look elsewhere for this item. Could not hold a small hose. The caddy fell over when I put the hose ar0und it. A piece of junk. The item is flimsy, no good at all ! To neatly put hose away, and not for it to be lying on the ground. 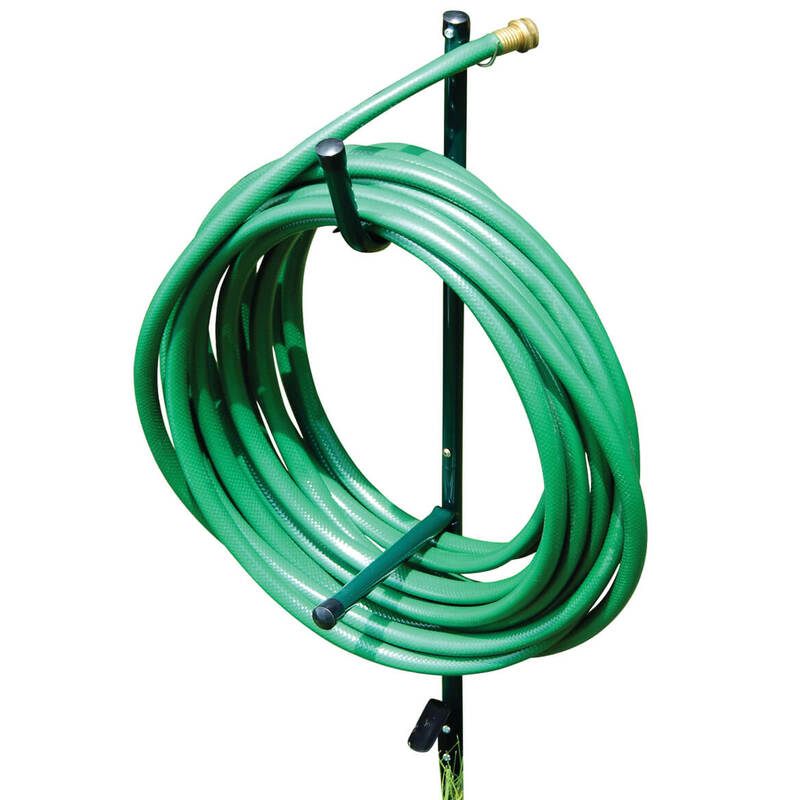 I’ Been looking for a hose caddy for awhile and this looks like it will be just right and the price is great. needed one to replace another hose caddy. Needed something so that my hose would not tangle. Apartment complex kept leaving hose lose and so I found a holder to accommodate the hose's lifespan. The convenience of having my hose close at hand and being to put the holder where I want it to be. Tired of hose being on ground. I wanted a hose caddy that I would not take up any room on our patio. This one I can put in yard. Convenience in storing outdoor hose. for my husband to avoid moving rolls of hose to mow. I need something to hold my garden hose. Tired of tripping over my backyard hose - didn't want to install a holder on the house, nor a big round planter to coil it into. This looks reasonable. This hose caddy will be used in the front shrub bed , of our home. We will no longer have to lay the hose on the ground. It can easily be moved to another location. M. Liles , Memphis, TN. I need to get a hose up and out of the way...hope it works! To be able to get my water hoses out of the way of mowers. Convenient and neat for the summer months of frequent use! Looks like it would be effective use for the hose. This is exactly what I needed to keep my hose off the ground and looking neat! my hose is out of control and my dog keeps biting them. hopefully this helps! Hard to find and more expensive and too decorative wanted something simple. Looks nice in the front yard.